A Wire Mesh Handler is intended mainly for use with a forklift; on the other hand pick-up points have been provided for use with a crane. The operator must decide the appropriate safety measures and requirements when using the Wire Mesh Handler with a crane. AV-1155 Wire Mesh Handler – w/Fork Pockets 39″ DC -Requires 48″ or wider Carriage – Handles up to 8 ft. X 20 ft. wire mesh bundles 13′ 7000 lbs 1025 lbs. AV-1155·36CCFP Wire Mesh Handler – w/Fork Pockets 36″ DC -Requires 44″ or wider Carriage – Handles up to 8 ft. X 20 ft. wire mesh bundles 13′ 6500 lbs 1025 lbs. 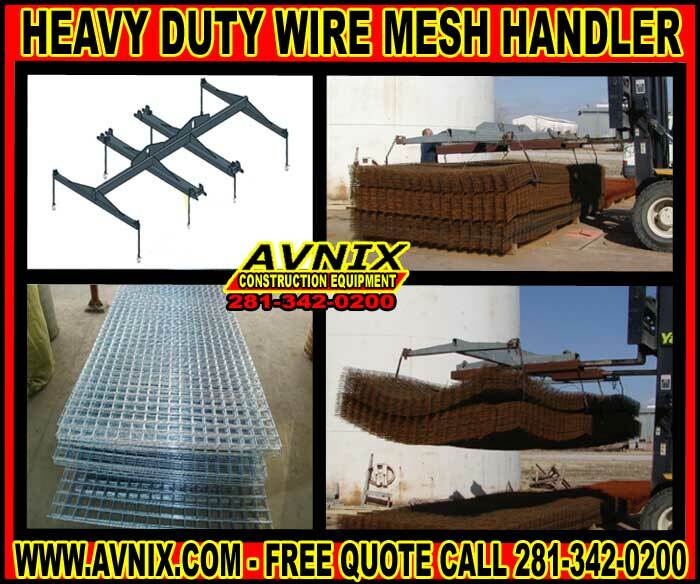 AV-1155-24CCFP Wire Mesh Handler – w/Fork Pockets 24″ DC Requires 32″ or wider Carriage – Handles up to 8 ft. X 20 ft. wire mesh bundles 13′ 6500 lbs 1025 lbs. Our Wire Mesh Handler must be used on smooth ground with the forklift forks level. Avnix advises using 6 or 8 hooks for bundles that are 20 feet long. For 6-point lifts, we recommend using the 4 outer hooks and a pair of hooks on one of the fork tubes. Using 4 hooks for bundles that are 10 feet long or shorter. For 4-point lifts of bundles 10 feet long or shorter, we recommend using the 4 inner hooks on the fork tubes. The load must be centered under the Wire Mesh Handler. Hooks must be used in pairs at each tube. Never lift with one end of a tube and not the other end. The lift chain lengths must be adjusted so that all are tight with correct load-sharing. The chains must be routed through the angle wedges such that the load is applied to the angle wedge and not the shackle attachment point. Lifting wire mesh should always be smooth – not jumpy. Before lifting, the forklift worker should be required to make sure all employees are at least 20 ft. away from the wire mesh. Should a bundle break loose, the stack has a tendency to spread rapidly which could cause severe injury or even death. Make sure all personnel on the ground are clear of lift area when lifting. Behind the heel of each fork and securing with hair pins or cotter pins. Safety chain(s] must also be used. Wrap chain around a strong part of the fork carriage and secure with locking grab hook. Maximum Rated Lift Capacity – 7,000 Lbs. Effective Length – 13 Ft.« Effective Width – 7 Ft. – 5 In. 1) Make sure the worker is well trained to operate the particular forklift model to be used, has read and comprehends this manual and has reviewed the forklift manual for any added requirements, limits, restrictions, or additional safety measures set by the forklift manufacturer when using this type of wire mesh panel attachment. The forklift worker must also be appropriately certified under OSHA requirements to operate the forklift to be used. 2) Inspect the Wire Mesh Handler attachment to make sure it is in good condition. There must not be any busted welds, nor any buckle of the steel tube or other parts, nor any cracks in the steel. Examine hooks shackles and chain connectors to make sure they are complete, are in good condition, and shackle anchor screw pins are screwed in tight and/or bolted shackles are correctly secured. Check to make sure the fork retaining pins have hair pins to secure them in place and safety chains are correctly secured to anchor blocks and grab hooks are properly secured. Current models are supplied with locking grab hooks and it is suggested that non-locking grab hooks be replaced with a locking style. Decals showing “Empty Weight”, “Read Before Using” and “Rated Lift Capacity” are required. Check that all decals are in place and legible. Replacement decals are available from Avnix. 3) Make sure workers involved comprehend any hand signals that will be necessary and all involved employees understand what will be required of them. 4) Make sure the travel path is clear of obstructions and that sufficient clearance will be maintained from all power lines. FORKLIFT REQUIREMENTS A forklift with sufficient lift capacity at the proper load-center distance for the desired load must be used. A forklift manufacturer or dealer is the suggested resource for information on required forklift size. In addition they can supply a de-rated load chart for use with the Mesh Handler. Star Industries will supply any information needed for their calculations. In addition be aware that the lift capacity of a forklift diminishes rapidly as the load center of the load increases. With the Wire Mesh Handler properly installed and handling eight foot wide mesh the new load center will be at approximately 4 feet. This means that if the forklift is rated at a two foot load center (typical for most medium size forklifts) then the lift capacity at a 4 foot load center will be half the rated capacity at a two foot load center. In addition the weight of the Mesh Handler must also be deducted from the lift capacity or added as part of the load when determining required forklift lift capacity. Fork length should also be taken into consideration. Again the forklift manufacturer or supplier is the recommended source for fork length requirements. Forks must extend past the center line of the mesh handler. Forks 6 ft or longer will likely be recommended.